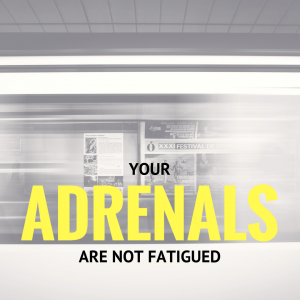 You Don't Have Adrenal Fatigue | Stop Being a Victim of a Catch Phrase. For those that aren’t familiar with the adrenal glands, they have huge function in your health expression. Every second of your day, your nervous system has to organize and coordinate your life experiences: What you eat, how you think, how you move, wind changes, social influences, spiritual experiences, and congruency in purpose and practices. With every single item, within microseconds, your nervous system has to decide if these particular influences will cause you harm or cause you happiness. More often than not, your nervous system will be cautious and engage functions that shift you into immediate survival and protection. The first set of organs that your nervous system talks to are your adrenals. There are two major hormone groups (but many more) that the adrenals release to help you adapt when life throws curve balls at you. One group is the catecholamines (adrenaline, epinephrine, norepinephrine, etc) that primarily work on functions of heart rate, blood pressure, muscle contraction, and triggering your brain for reaction over reason. The other class is cortisol that primarily works to get your body to release stored energy (sugar) to give you instant fuel to escape a potential danger. The longer someone is in the this state of protection, the more the body creates a default setting into that expression. And the longer than is expressed, the more apt you favor catabolism (tissue destruction). This sounds bad but no reaction or symptom is stupid. These expressions are creating pathways for you to buy time to escape what is potentially life threatening. The more this reaction is repeated, the harder it is to keep up with the demands. It’s like if you sprinted instead of walked to do everything. You’re going to get tired. Many times, people come in with a notion that they have some sort of adrenal fatigue. They have tentatively diagnosed themselves due to trouble falling sleeping at night and being tired in the morning. They seem to be gaining weight and sick more often than not. They may even say they feel worse on a low carb diet. They have mood shifts, depression, anxiety, thyroid issues, and maybe even infertility. While there is an adrenal involvement in all chronic illness, the the chance that you are in fatigue or exhaustion probably isn’t the case. When someone is truly adrenal fatigued or exhausted, they are literally struggling to stay alive. My super assistant has a family member that recently passed away I would put in that person in a true adrenal fatigue category. A few months back, while prepping for a surgical procedure, they wanted him off his medications. he tanked quickly and when they measured is blood sugars, it maxed out at 20. Not only was he a diabetic but it turned out he had been on a long term steroid and it was the steroid, doing the work of the adrenals, that were keeping him breathing. Though I shy away from saying he was living. So what’s the bigger issue? This is where I like to look more into systems and origins opposed to just symptoms and organs. The symptom is usually poor energy, the systems are usually your ability to produce ATP to keep up with your life demands and methylation to repair your life demands. If your life is constantly in go mode, busy, poorly eating, hateful relationships, cubicle living, medication use, and without purpose, this will shift your nervous system into that protection mode. Think of this like stepping on the gas pedal of your car, flooring it, with no intentions of letting up. Your demand for fuel is going to be greater and more frequent than someone setting the cruise control at 30 mph and enjoying the ride. If you still have the capability of pushing on with life, despite being tired, I would argue you don’t have adrenal fatigue. But this doesn’t mean there isn’t a problem. This means that if you want to keep your current lifestyle on full tilt, you have to refuel with a higher grade of fuel and more often. You need to support your body’s ability to produce ATP. Where most get frustrated is that they have been told to take glandulars to support the adrenals or adaptogenic herbs to help the adrenals function. But these people are still missing the point. They have bypassed the most simple of reactions in the body that would help support ATP production, which then goes to supporting all our physiological functions. Your ability to adapt and sustain life is based on a simple equation. Your ability for your adrenals to fire will be based on the amount of raw materials to work with. Ingredients + Recipe = Dinner. This really is more ‘Substrate + Enzyme = Product.’ The recipes (enzymes) are coded for in your DNA. This is the constant in the equation. The ingredients (substrates) are vitamins, minerals, fats, and amino acids. The dinner (product) is then used as part of the ingredients in the next series of reactions. Genetically, we all require the same basic reactions. But our life experiences and choices will dictate the level of ingredients we need to put into the recipe to get the desired product. If you’re the busy, pleasing all, super mom, you need a higher quality and quantity of ingredients. If you’ve been on antibiotics multiple times, you need a higher quality and quantity of ingredients. If you are a semi-competitive-worker-outer, you need a higher quality and quantity of ingredients. And if you’re all 3 together, guess what? You need a higher quality and quantity of ingredients. But being deficient in things like rhodiola, ashwagandha, and licorice root are not why your adrenals are on overload. These are plant medicines, not required nutrients. No disease has ever occurred because you’re deficient in those herbs. But many diseases occur based on not having enough B12, Vitamin D, EPA Omega 3, etc. My point isn’t for you to go load up on these nutrients haphazardly but design strategy around understanding your specific needs. Take inventory of your life, build in strategies to find rest before rest finds you, and don’t guess with your nutrients. Your life experiences will be the biggest determining factor of your quantity of support needed. And testing can be a way to quantify it. A great place to start with testing is one of my favorite tests called Organic Acids. If you need help, you know how to find me.